Aran Biomedical produces a range of applications and solutions for use in intraperitoneal hernia repair procedures. This range encompasses composite meshes, cPTFE meshes, parastomal and umbilical meshes. Aran Biomedical uses proprietary processing to develop condensed polytetrafluoroethylene (cPTFE) mesh, which can be custom designed and manufactured to your specifications. cPTFE material offers the anti-adhesive qualities you would expect from PTFE, but it does not have the node and fibril structure associate with conventional ePTFE (expanded PTFE). In general surgery applications, the anti-adhesive and bacterial resistant cPTFE membrane is processed with a dynamic macro-porous structure. This provides a supple feel, while accommodating tissue integration. cPTFE can provide relatively high strength in a unique monolayer construction, enabling the development of some of the thinnest mesh on the market. The thin design of the mesh accommodates trocar deployment of large mesh during minimally invasive surgery. 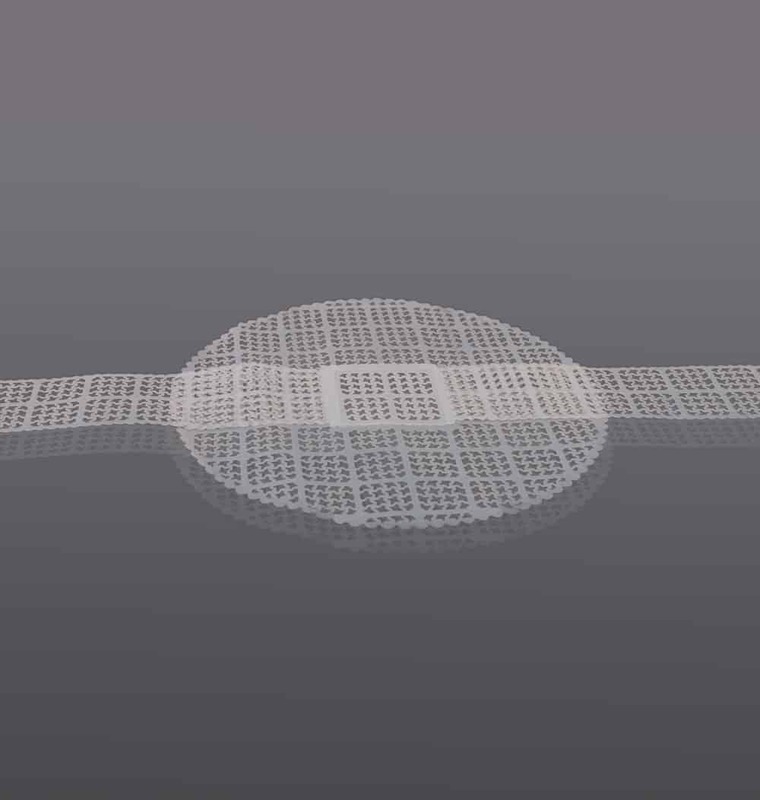 Thin resorbable membranes can be applied to one side of a knitted hernia mesh, which is intended to help minimise the formation and severity of visceral adhesions following implantation. This is particularly important during intraperitoneal implantation (IPOM) for ventral hernia repair. Uniform membranes can be developed as low as 20µm thick, with the material choice tailored to provide the appropriate degradation profile, strength and elasticity. 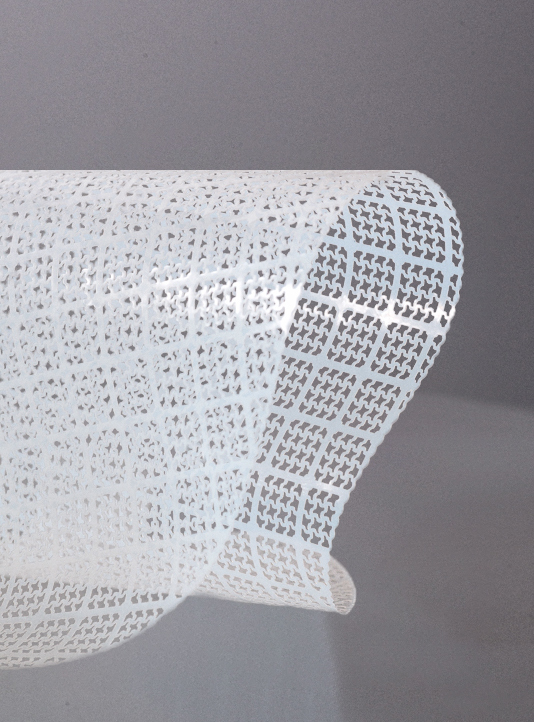 The unique anti-adhesive coated resorbable layer can be used with any flat, textured or shape formed mesh to improve clinical outcomes. The use of surgical implants with indicator markers provides surgeons with valuable information when positioning devices, ensuring that the mesh is appropriately orientated to compliment the mechanical performance of the mesh with the anatomy and ensuring the appropriate side of the mesh is applied to the peritoneum. This supports accurate and consistent placement tailored to the implant design, while also helping to reduce procedural time. Enhanced visualisation can also be achieved with the use of radiopaque materials, while the process for applying indicators is extremely versatile allowing for unique customisation. Aran Biomedical offers high definition indicator design solutions for any hernia mesh design, using FDA approved implantable grade dye. Aran Biomedical’s contract design and manufacturing services include a full suite of composite mesh capabilities to support new product development, including unique mesh solutions for particular anatomical applications, such as parastomal and umbilical mesh. By leveraging both its materials expertise in resorbable and non-resorbable biomaterials, and comprehensive processing capabilities, Aran Biomedical will work with you to ensure the optimum performance is achieved for your mesh, whatever the application.